He builds everything by hand, with antique and vintage tools, some are well over 100 years old! No power tools involved whatsoever. Everything is made with time, love and care. I'm fascinated by his wonderful and interesting projects. ...and finished with a natural non-toxic finish. It's actually safe enough (when completely dry of course) to eat off of. Not that that will be happening, but good to have on toys too. I think it shows off the natural beauty of the wood too. I've showed this as a work in progress before, it's a simple granny square with alternating rounds of dark pink, light pink, dark purple, and light purple. Each round of color is separated by a round of white. I really, really love this blanket. When I began this project, my intention was for it to be a full sized (person) blanket large enough to cover a bed. I changed my mind about halfway though because I want to make something a little chunkier and loftier (this one is worsted weight yarn). Partially finished afghan? The perfect dolly blanket! I plan on making a little mattress for it too, I'll share that with you when I get around to making it. 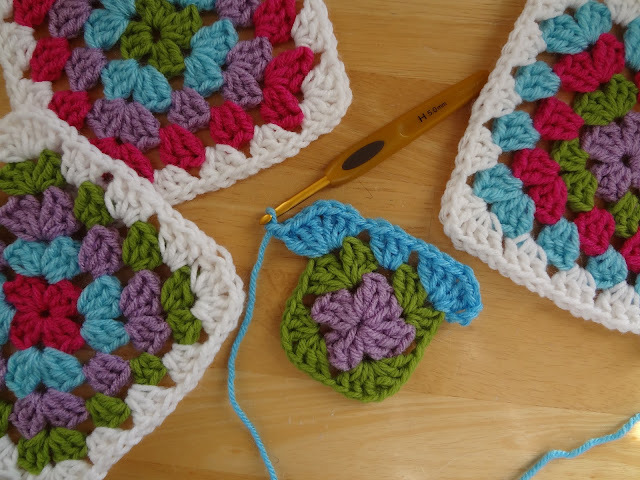 Click here to make your own granny square! Boy do you two make a great team, I love that you both work with your hands, but in different ways. You both put love and care into everything you make. Thank you as always, making things is so important to both us, I for one am a happy girl when I have something to work on! It is my happy outlet!